Commencing the digital transformation journey by adopting automation solutions to increase revenue, reduce costs and scaling operations is essential to improve the bottom line. An autoquotation and online ordering system is a powerful enabler as it can be used to provide quick responses for your customer requests for quotation with minimal effort and maximize the closure of deals to improve the top line as well as bottom line for your business. Manex consultants have several decades of product and service innovation experience in information technology and more recently in digital transformation and automation for factories to deliver an affordable and turnkey auto-quotation and online ordering solution. Manex focuses on building an achievable and sustainable plan for a three to five-year period including projections, strategy and tactics to get there in addition to building a solid mission, vision and set of values. We work directly with the C-suite and key division heads in teaching leadership, strategy development and execution. Slow request for quotation (RFQ) responses can result in loss of business. Highly skilled labor spent on RFQ processing increases operational costs affecting the bottom line. RFQ processing is typically performed by the highest rate labor. Lower rate of deal closure results in lower revenue growth and increased idle time adversely affecting the top and bottom line. Response to quotation request can be instant or within a couple of hours for 95% quotations with just a few minutes of effort resulting in cost reduction. Deal closure (percent of quotation which result in a purchase order) can significantly increase especially when combined with digital marketing initiatives resulting in increased in revenue. Progressively, resource utilization (i.e. people, machines) is optimized and/or maximized resulting in cost reduction. Adopting an auto-quotation and online ordering system can be considered as the first step in your factory’s digital transformation journey. 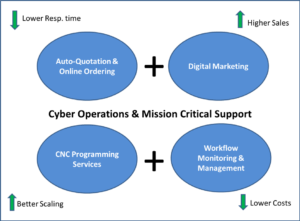 A holistic approach would include adopting other solutions (refer to diagram below) that increase revenue (digital marketing), reduce costs (workflow monitoring and management) and scale your operation (remote computer numerical control [CNC] programming) with minimal investment in capital equipment and labor. Our projects average more than 600% ROI – that’s a $6 return for every dollar invested in these activities. For more information or to schedule an appointment, contact Manex at 925-807-5100 or email bizdev@manexconsulting.com. New and interesting manufacturing webinars and events coming up. "Manex has been a tremendous partner helping us with our Lean transformation. Their in-depth expertise, on-site support, and commitment to results have been instrumental in helping us achieve significant results to date and also ensure that we have the processes in place to sustain them in the future."